Plantar fasciitis is pain felt at the bottom of the heel or through the arch of the foot. It is usually felt on the first step out of bed in the morning or when walking again after inactivity. 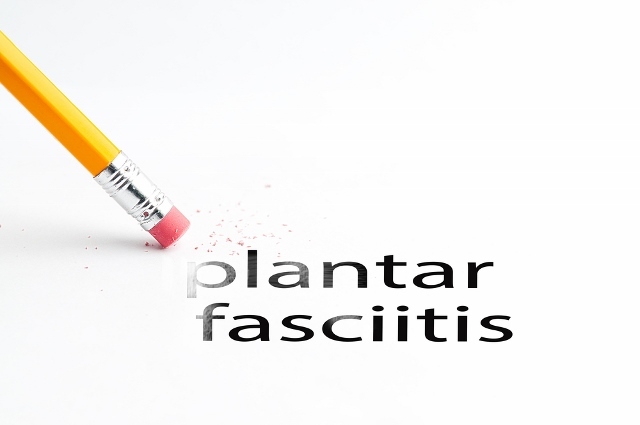 However, plantar fasciitis pain can eventually be felt any time you are walking, running or jumping, and be more noticeable after lots of exercise. It can be a severe sharp localized pain, or an ache. 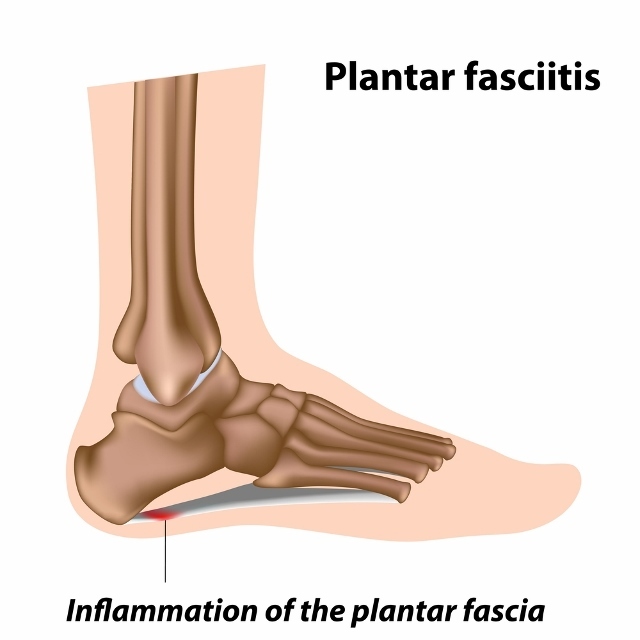 Excessive pulling of the plantar fascia (connective tissue) on its attachment to the heel leads to local inflammation and pain. It usually develops gradually over a period of weeks or months, but can develop very quickly if the tissue is overloaded. The plantar fascia acts as a shock absorbing spring to support the arch of the foot. There are many factors that can lead to increased mechanical loads upon the plantar fascia – usually these include a combination of increased tension, decreased shock absorption, and decreased support. Each individual will have a different set of variables, making a thorough examination vital to ensuring the fastest recovery. Increased tension on the plantar fascia can result from increased body weight, increased exercise, flat feet, or from shortened (or “tight”) muscles in the calf or foot. Decreased shock absorption can result from insufficient cushioning in footwear, anatomical differences such as high arches, or rigidity in other areas such as the knee or hip. Decreased support can also be from poor footwear, reduced muscular strength intrinsically within the foot, or muscle imbalances higher at the knee or hip. Whilst plantar fasciitis is primarily an issue of excess mechanical strain, it is sometimes found in systemic rheumatoid conditions. The symptoms can be treated through a variety of methods. It is important to ensure that not only do we address the symptoms of pain and inflammation, but that we identify and treat the underlying causative factors that are generating strain at the plantar fascia. Rest: minimizing time spent weight bearing, walking or exercising will have an obvious effect on reducing tension across the plantar fascia, and therefore reducing inflammation at the heel. Ice: often used to decrease pain and reduce local inflammation. A frozen lime or water bottle under the foot can be used to apply massage as well as cooling the area. Supports: orthotics, innersoles, more supportive footwear, or tape can all be used to provide an external support that will reduce pressure on the plantar fascia. Anti-inflammatory medication is also often prescribed by medical practitioners. Sometimes treatment is quick and easy. However, if there are underlying bio mechanical dysfunctions, true long-term solutions will often require changing habits, muscle length and strength via an exercise program. How can we prevent recurrence? Footwear choices can make a significant difference – wearing appropriate footwear for your foot-type, and preferred exercise, can decrease the loads across the plantar fascia. We also proactively look for ways to help distribute load more effectively through the lower limb. If we can decrease impact forces, and spread force through stronger muscles, the plantar fascia is less likely to become irritated. Often this involves increasing the range of dorsiflexion through the calf, improving the range of hip extension to facilitate better gluteal function, as well as strengthening the rotators/stabilisers of the hip, and the calf/foot itself. Let us design you a personalized stretch and strengthening program. Remember, treatment is focused at reducing symptoms, whilst rehab is aimed at making your movements more efficient, smoother, stronger, and minimize future issues. Making those changes can only be done through persistence and commitment from you, and may take time. Be patient and keep working at it! Lori A. Bolgla and Terry R. Malone.